cjmarq2345 has no other items for sale. (DISCLAIMER: I HAVE NOT YET BEATEN THE GAME) I haven't played Superstar Saga, Partners in Time, or Bowser's Inside Story, but Dream Team so far has compelled me to, at some point, visit every one of its predecessors. The battles, overworld, dream world, writing, game mechanics, graphics, and aesthetic of this game are extremely compelling, as well as numerous more. The only things about the game that I dislike so far are the easiness (i.e. could be more challenging) and the infamous tutorials, which probably really only negatively affect those who have played every game in the series. 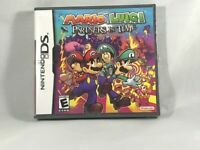 These cons are of course small potatoes, and as such, paired with the many pros of the game, is why I would highly recommend Mario & Luigi: Dream Team to anyone who has a console in the 3DS family or is looking for a reason to buy one. Great mix between 2D sprites, 3D models and particles that take advantage of the 3D effect. I recommend using the New Nintendo 3DS or New Nintendo 3DS XL/LL for the face tracking 3D. The game has most if not, all of the characters and bosses in sprites, which has a nice retro feel, but having better spritework than the previous games like Bowser's Inside Story and Superstar Saga. Sadly, Fawful isn't in this game but Popple from Superstar Saga is. :D Be wary, he may try to take your hammer or items. The environments are made out of 3D models and HD textures and it's for the better, as it adds some charm to the game, with the world not being hardcoded collision. It's also pretty cool how things like carpet sound different than tile or sand, something really missing from the last 3 games. 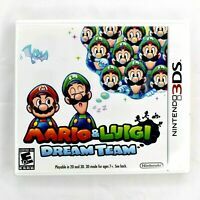 Altogether; Mario and Luigi Dream Team is a game you cannot pass up. 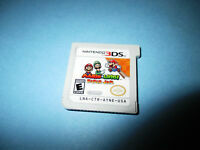 If you Like the humor of Mario games and like the battle and adventures of RPG's, this game is a perfect fit for you. Excellent game with loads of fun laced throughout! 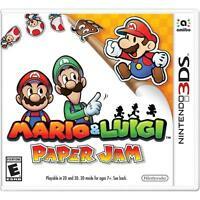 Great game, its good for those Mario and Luigi lovers of games. Reminds me of super Mario world and the like. 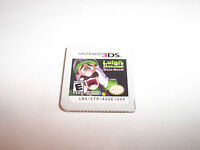 It's one of those games that would be great for a younger child or the Mario enthusiast. This game is quite easy, and is one of those that is perfect for the "in between" moments in life, like waiting for a bus, or on a lunch break or something like that. Great game. Perfect for what the game is intended for. Great buy. We love our 3DS consoles! We play a variety of games from Super Smash Bros. And Mario Party to Pokémon and Monster Hunter and all of the gameplay experiences thus far have been great! Support for wifi and local via Bluetooth makes multiplayer simple and effective. I would definitely recommend this to anyone looking for wireless gaming on the go or at home on the couch. Product looked as if it had barely been used. It was in such great condition and included the original case and booklet inserts. 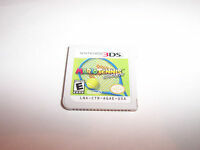 Game is in perfect condition and the game works well!